Dr. Bethel Balge at the new Boston piano. A milestone of sorts was reached on Wednesday, August 1, 2018, when a new grand piano was delivered to the Ylvisaker Fine Arts Center. Bethany Lutheran College is in the midst of a campaign to replace old and damaged pianos throughout the campus. Dr. Bethel Balge (Music, Piano Instruction) is organizing and leading the effort. The new grand is manufactured by Steinway and Sons and carries the Boston pianos name. Bethany’s plan is to replace all of the aging pianos with either the Steinway or Boston brand. 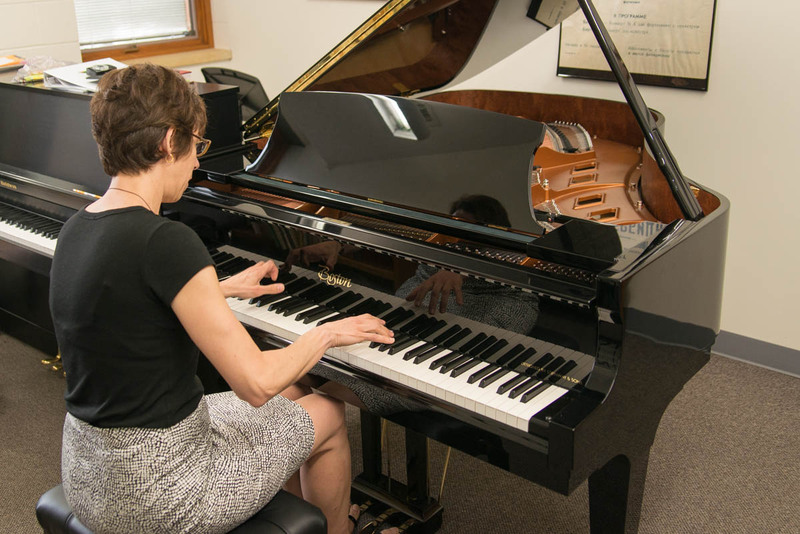 The funding for the piano replacements has come from both individual donors and the National Bethany Auxiliary, which voted at their September 2017 meeting to establish a dollar-for-dollar challenge for contributors to the fund. Bethany thanks all who’ve contributed to this special project. To learn more about the piano replacement fund, please visit the Bethany Steinway Fund website. Photo slideshow showing the move-in process and Dr. Bethel Balge with Professor Dennis Marzolf after the moving was complete.